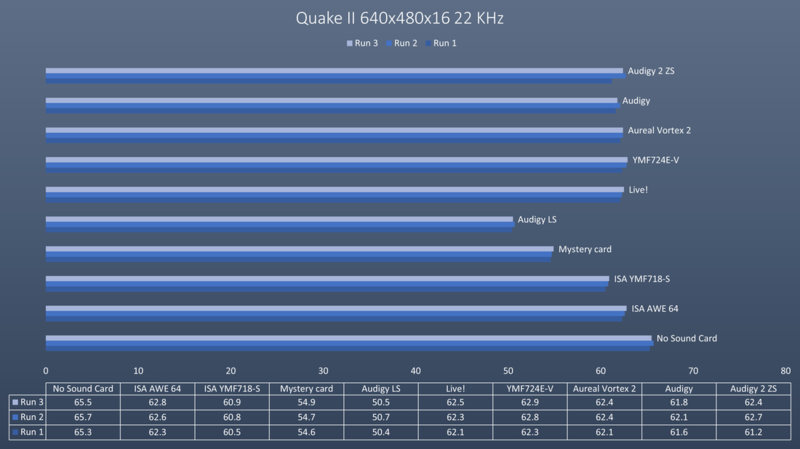 What is the best Sound Card for Super Socket 7? So you have decided on building a Super Socket 7 Retro Gaming PC! Good on you! Such a machine offers great flexibility, with software selectable multiplier on some processors as well as the ability to slow it down to 386 and 486 levels for DOS compatibility with older games. 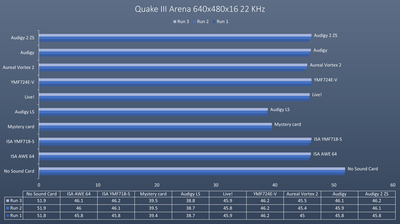 Running at 550 MHz or so it also has enough power to play newer games such as Unreal, Quake II or Descent 3. But what about the Sound Card? 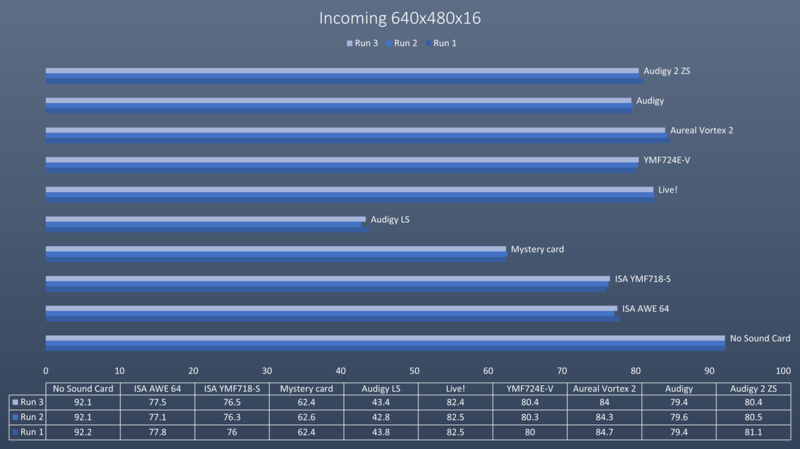 These processors offer limited performance so we don't want to use a Sound Card that is taxing on the processor. 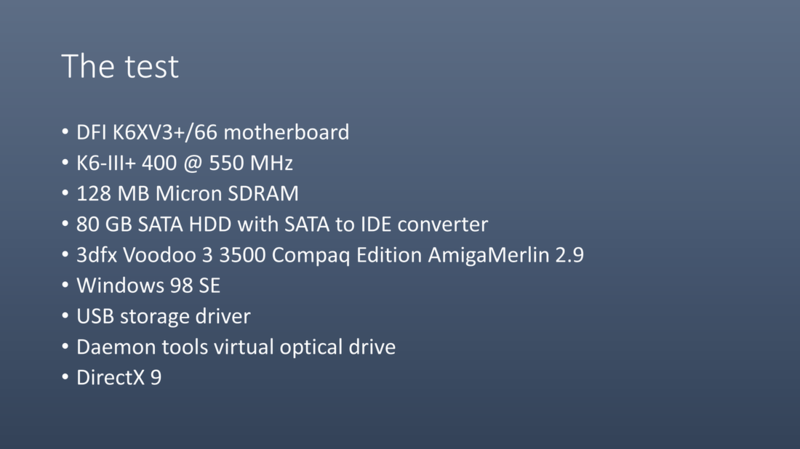 There are interesting technologies such as A3D and EAX, do these features make sense for a Super Socket 7 machine? 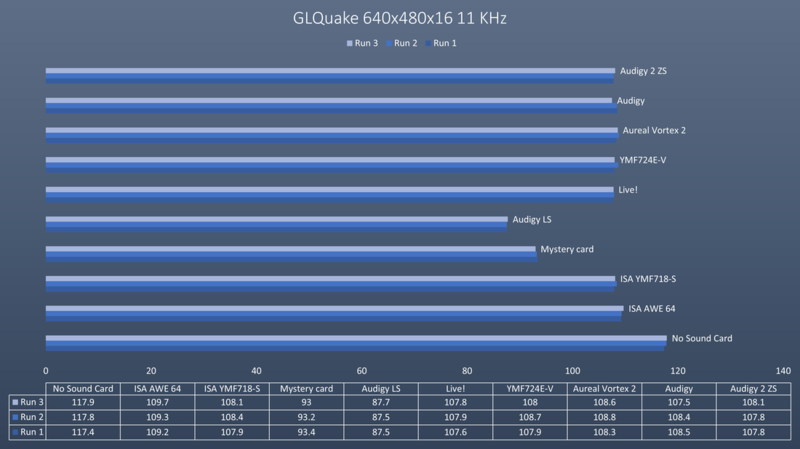 So here I have tested a few Sound Cards in a 550 MHz Super Socket 7 machine. Two cards are ISA cards, these are great for DOS compatibility, but for Windows gaming, are you better off with a PCI card? Remember that you can run both, ISA and PCI Sound Cards in the same machine and get the best of both worlds. 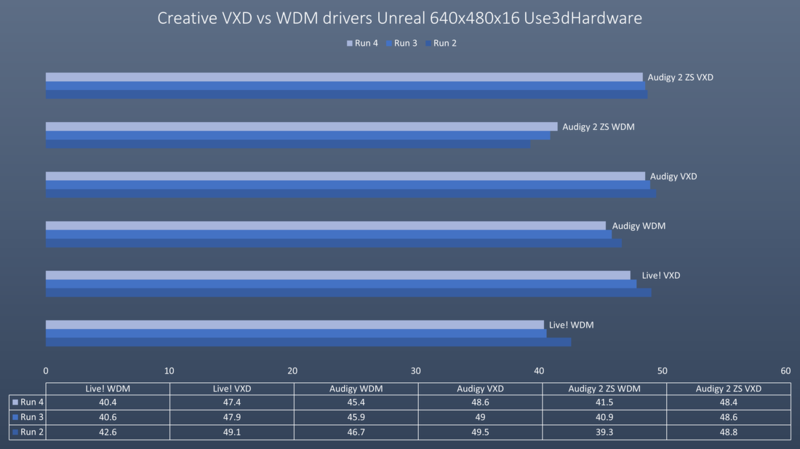 Here are some charts showing the performance difference between VXD and WDM drivers. 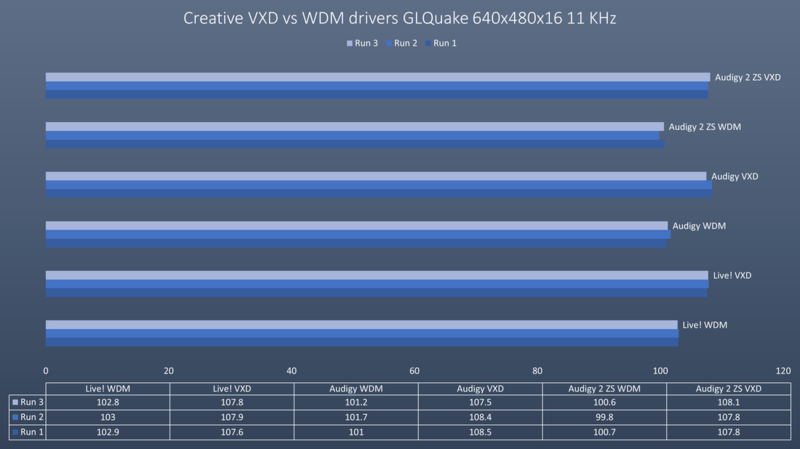 On a Super Socket 7 platform you definitely want to use the VXD drivers. 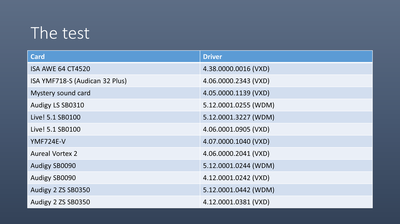 On the newer discs, the installer will install WDM drivers first, and then you change them over to VXD. The Audigy 2 ZS has a Start Menu entry for this, on the other cards you need to run a file from the CD. 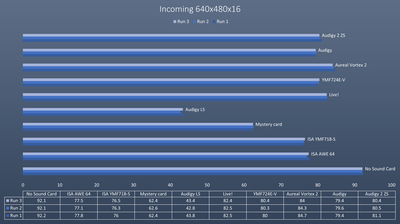 Before we look at the benchmark results I want to take this opportunity and talk a little bit about each card, it's main strengths and weaknesses. This card offers best compatibility with DOS games. I'd be surprised if there are DOS games that do not work with this card, it's a Creative card after all. It is fairly quiet for an ISA Creative card and doesn't exhibit the famous hanging note bug when connecting a MIDI device. The weak areas of this card is the lack of wavetable connector, so you can only use external MIDI devices and it doesn't have a genuine Yamaha OPL3 FM chip if that is what you're after. This card is compatible with the Sound Blaster Pro 2 and Windows Sound System standard, so a lot of DOS games will work fine. However not all of them, being a non-Creative card you will run into games that exhibit issues. It does have a genuine Yamaha OPL3 FM chip which many DOS gamers are looking for. 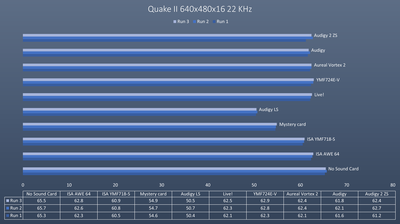 It is a very quiet card, quieter than pretty much all Creative ISA cards and it also has a wavetable header, so you can attach something like a DreamBlaster S1 or X1 for improved music in games that support General MIDI. This card has an interesting story. It was the last card that Ensoniq produced. It is highly integrated and it was all about cost saving. 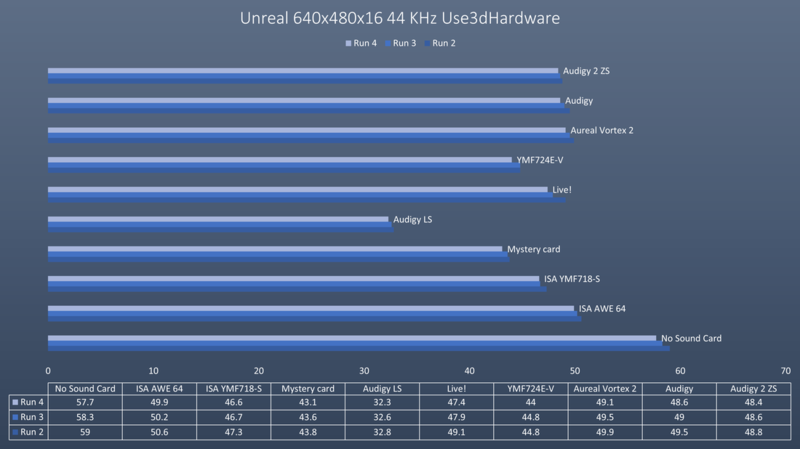 Most of the sound processing is done in software and that shows in the benchmarks. This Audigy card does not feature the Audigy processor and does, just like the AudioPCI, process things in software. 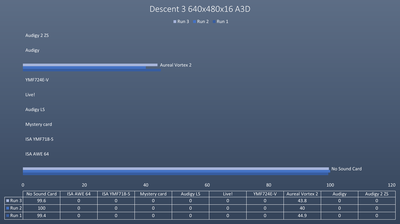 This also shows in the benchmarks and it didn't help that I was unable to find a faster VXD driver for this card. A very popular card. There are many versions of this card, so sometimes you get an OEM card which won't work with the retail driver CDs. So best to do some research into the various model numbers. 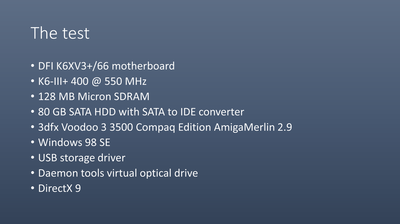 This card is very fast, do use the VXD driver however. The driver installation process is a bit lengthy, but not as long as with the Audigy cards. Also a very highly integrated Sound Card with the Yamaha 724E-V chip. Has a Sound Blaster Link connector which I know some people are chasing to improve DOS compatibility. 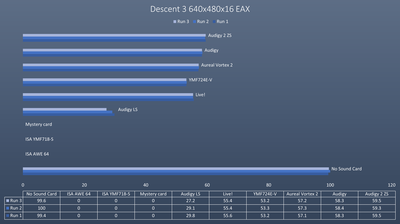 This card is compatible with EAX and A3D, but I found that the compatibility and quality is quite average. The drivers are great, no need for CDs, just run them and they are installed in seconds. I love this card! 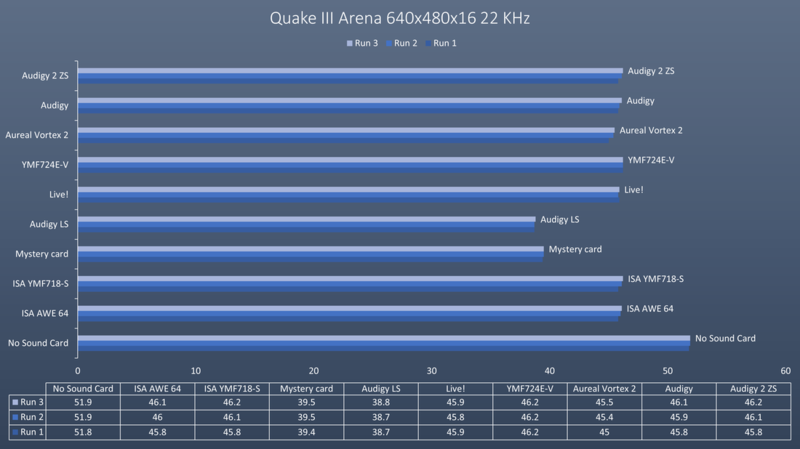 I like to play with headphones and this card is the King of A3D gaming. 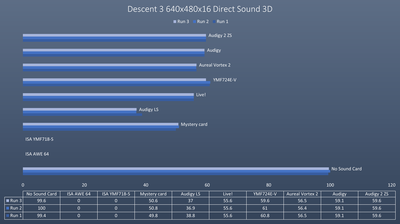 If you play a game on this Sound Card with headphones and it supports A3D, you are in for quite an experience. 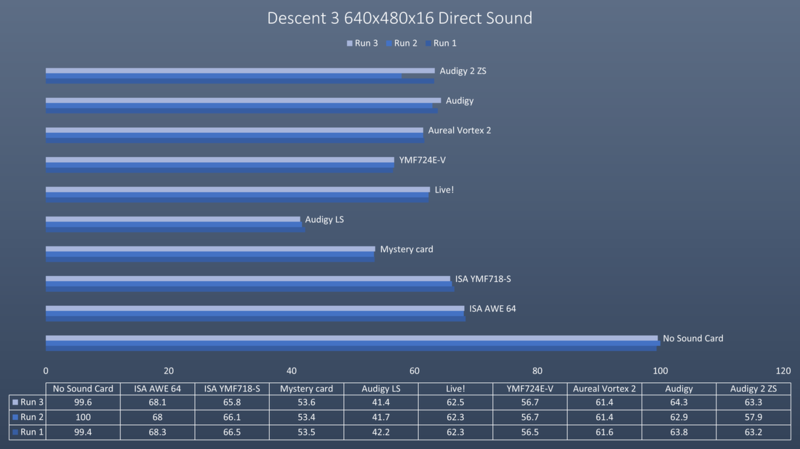 It sounds great, but so do other cards, but what separates this card from the rest is the accuracy of 3D sound positioning. 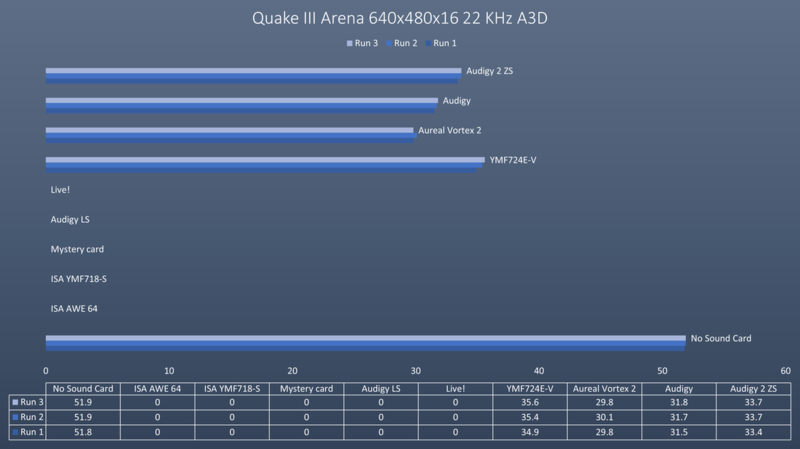 It is like having an extra sense and you will be able to acoustically locate players, for example in Quake 3, with unbelievable precision. The card is not really compatible with EAX, here you are better off with a Creative card. It does have a wavetable header and decent DOS support, but I would recommend going with an ISA card for DOS regardless. There are various drivers for the card, make sure to go with the 2041 drivers. 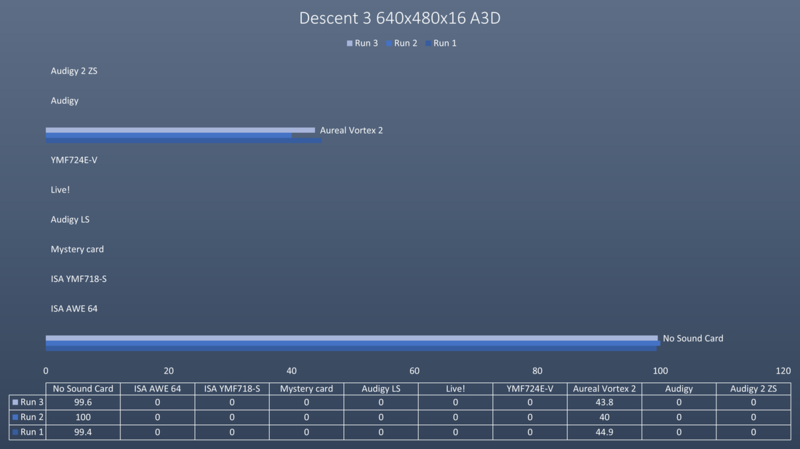 And then there are variations of that 2041 drivers, some without DOS support, that's not always wanted or needed and one addressing a PCI error message. You can get the drivers from here. These are pretty much the final and best Creative Sound Cards for Windows 98. This is the first time of me using them, so I was very keen and interested. 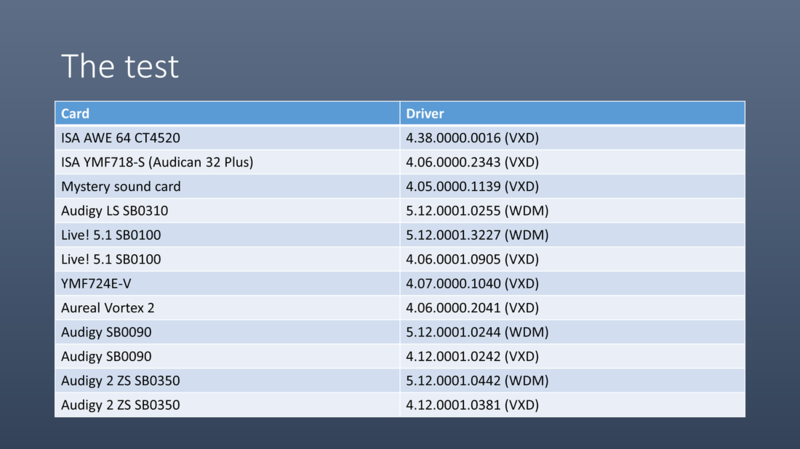 The driver installation is a bit of a pain, you need to install the WDM drivers from the CD which takes a while, then switch over to the VXD drivers. The Audigy driver CD hides this from you, there is a folder on the CD with an executable to trigger that driver changeover, the Audigy 2 driver CD puts an option into the Start Menu. 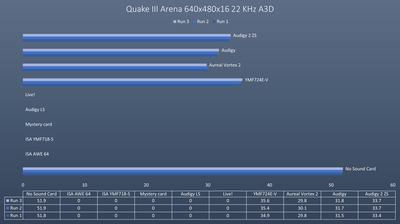 Now, the Audigy 2 SZ totally impressed me. It sounds absolutely awesome. Better than the Audigy, so I see no need to get the Audigy and would look around and insist on getting the Audigy 2 ZS. 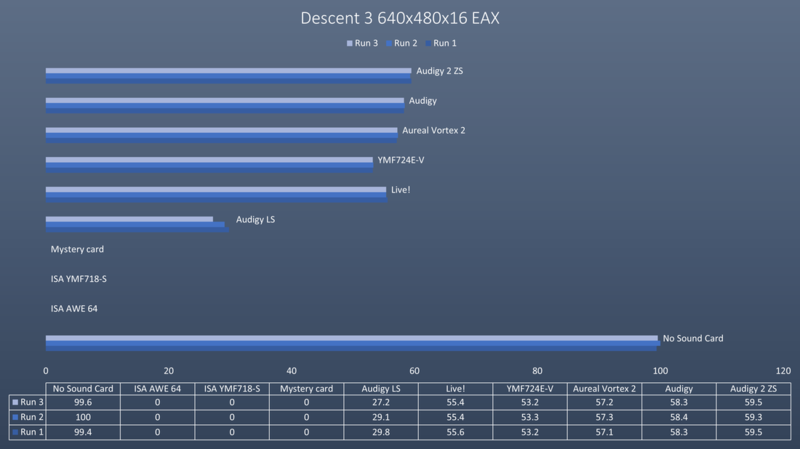 The Audigy cards are also the fastest with EAX and both cards support A3D. 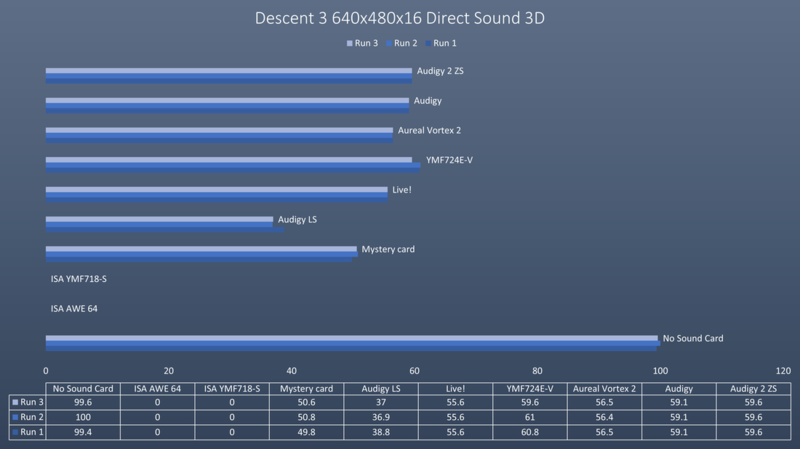 However if you're into A3D, you are better off with an Aureal Vortex 2 as the 3D positioning over headphones with the Audigy cards is not nearly as good as with the Vortex 2. But for general gaming and EAX these are the best options. 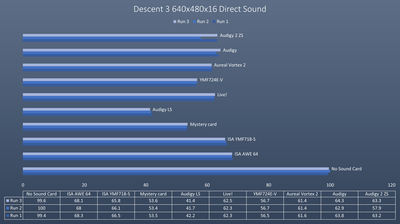 And yes, I say it again, the Audigy 2 SZ left me walking away with amazement, it sounds that good! 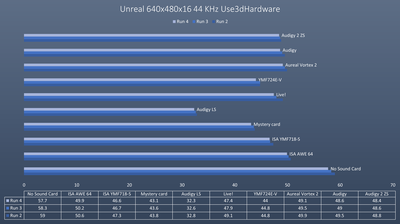 And here we have all the benchmark results!